The 2018 INKAS Mercedes-BenzG63 AMG is an armoured SUV limousine that is being listed for €1,000,000 ($AU1.6 million). 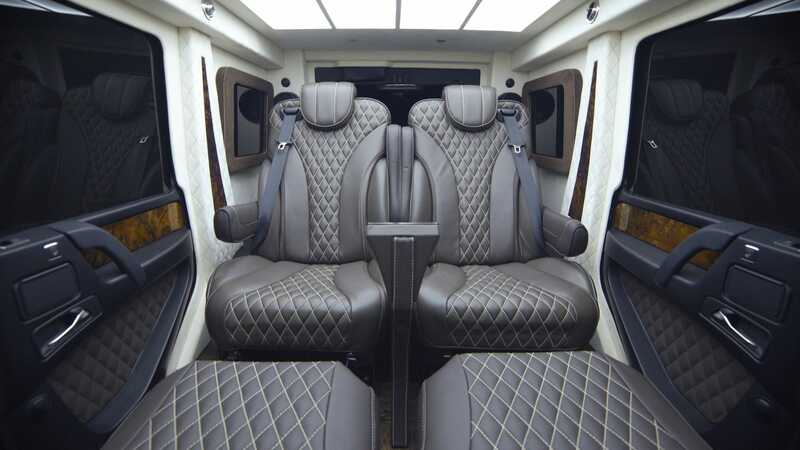 Its armoured car features are manufactured by INKAS and include bullet-proof glass, a fire suppression system, and a perimeter surveillance system with both infrared and thermal cameras able to record movements and events outside the car and upload them into a secure server on a cloud. The car also has voice-activated controls and a 4K ultra-high definition TV with Apple TV integration. The 2018 INKAS Mercedes-Benz G63 AMG is a stunning bullet-proof armoured SUV limousine listed at a price of one million euros or about $AU1.6 million. 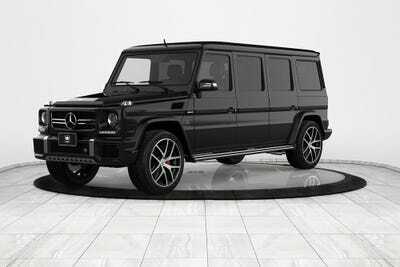 The engine is a 5.5 L Gasoline V8 with a 563 horsepower at 5,500. The drivetrain is permanent all-wheel-drive with a fuel capacity of 96 litres. Toronto-based INKAS Armoured Vehicle Manufacturing handled all of the security perks. As an armoured car its features include runflat devices (which are tires that resist deflation when punctured), reinforced suspension, reinforced door hinges, multi-layer bullet resistant glass, a vehicle security system that is accessible from the front cabin, and a passenger compartment that is protected by a perimeter surveillance system with both infrared and thermal cameras able to record movements and events outside the car and upload them into a secure server on a cloud. There is also a fire suppression system, emergency lights system, heavy-duty brake system, and a siren/intercom system. 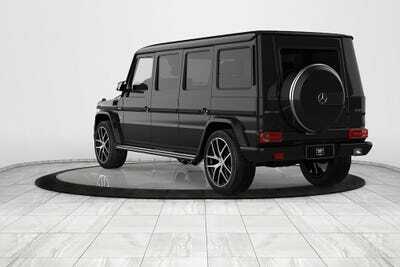 According to the INKAS website, the car meets a CEN 1063 BR7 armour level, meaning the 2018 Mercedes Benz G63 AMG can withstand ammo from a 7.62mm hi-power rifle and explosions from up to two DM51 hand grenades. As for the less dramatic features, inside the car has a 4K ultra-high definition TV with Apple TV integration along voice-activated controls and premium, two-speaker surround sound. There is a cool-bar made of authentic Turkish walnut burl and two gigantic captain seats fitted with Alcantara suede and top-grade exotic leather. On the ceiling, there is a customised daylight headliner that is made to imitate the effects of real sunlight so as to reduce stress and increase relaxation. Also, and this is rather important, the 2018 Mercedes-Benz G63 AMG seats 4 people comfortably. 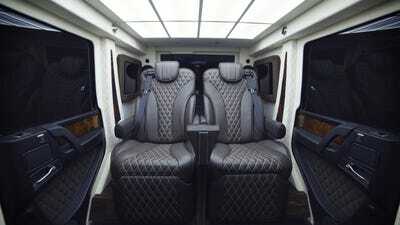 This SUV limousine is 100% bullet-proof. Don’t even think about messing with it. The 2018 Mercedes-Benz G63 AMG is listed at €1,000,000 euros. Yes, you read that correctly. The car is a security wonder. 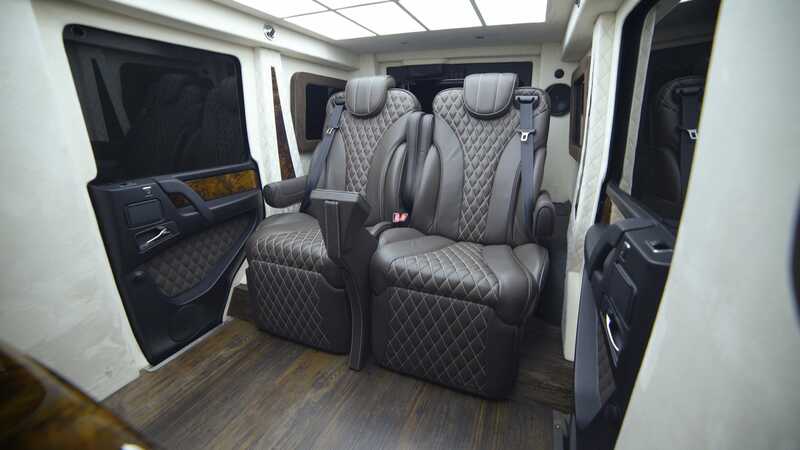 It is made with advanced body armour, ballistic glass, and has a perimeter surveillance system featuring infrared and thermal cameras that can record movements or events outside the car and then upload them to a private cloud server. Inside, there’s Apple TV integration, voice-activated controls using Apple Siri and HomeKit Integration, and a 4K ultra-high-definition TV monitor. 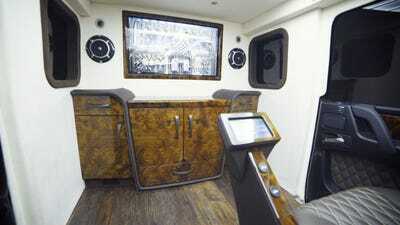 Notice the two gigantic speakers beside the TV that provide the premium audio system. 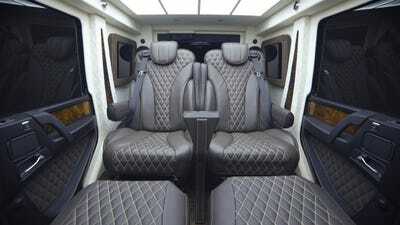 You’ll see that more than half of the interior is fashioned with an ultra-premium version of Alcantara suede. The rest is stitched in a top-grade exotic leather that is specifically durable to enhance longevity and avoid wear-and-tear. Right beside the captain seat cushions is a built-in control center that is able to dictate all of the vehicle’s media, lighting, comfort and security functions through either voice control or the touch of your fingers. 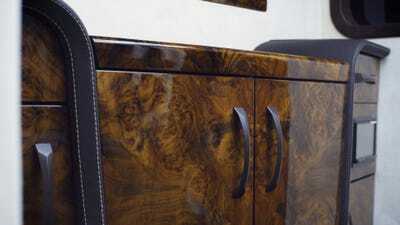 There is a motorised bar with a built-in cool-box made out of multiple veneers including an authentic Turkish walnut burl. Go ahead, and treat yourself to something cold. 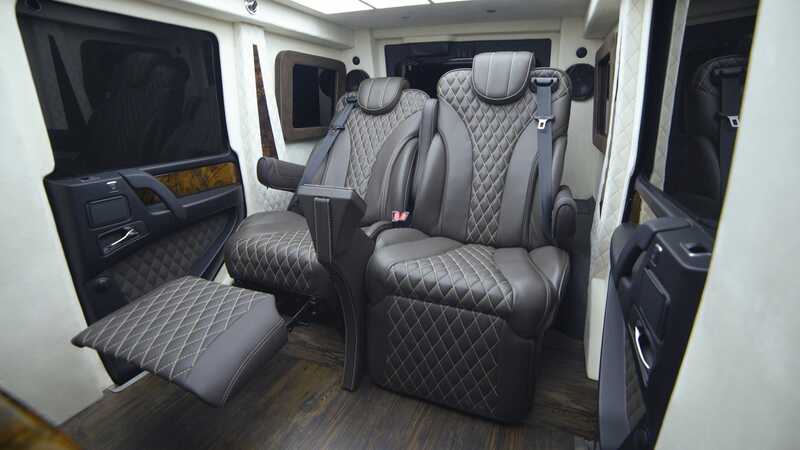 The two captain seats fully recline to offer passengers the utmost comfort. If you’re wondering, they also include a massage function. If you can’t already tell, it’s pretty spacious in there. 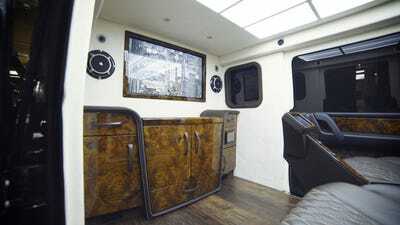 There is a customisable daylight headliner that is made to imitate real sunlight in a highly accurate manner so as to “reduce fatigue and increase overall well-being,” as much as one can in an armoured car built to withstand machine gun fire and grenade explosions. 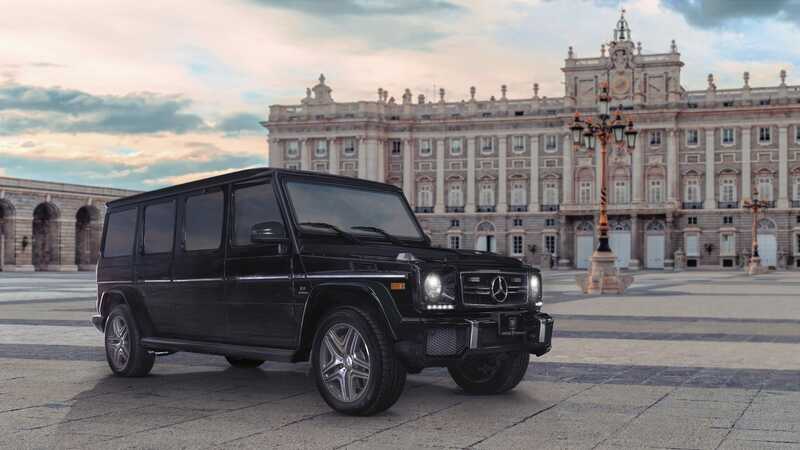 The truck meets a CEN 1063 BR7 armour level, which is one full level higher than its armoured predecessor, the 2015 INKAS Mercedes-Benz G63 AMG.